We are Importer and wholesaler of Fashion Jewelry such as Magnetic Copper Bangles, Magnetic Copper Bracelets, Copper Cuff Bracelet, Hematite Necklaces, Hematite Bracelets, Hematite Rings and Hematite Earrings, also Paua Shell Bracelets and Anklets, Mood Rings, Shark Teeth Necklaces, Shark Teeth Pendants, Bone Necklaces, Sterling Silver Jewelry and more..., TO PLACE YOUR ORDER PLEASE READ FIRST OUR WHOLESALE TERMS , you can order by Phone/Fax or Use Our Order Form. Hematite B-Grade Necklaces $ 6.50 dz. Cross Magnetic Copper Bangle (Cuff Bracelet) with 6 strong Magnets 3 on each side, each Magnet between 2000-3000 gauss, smooth finish, highly polished, solid Copper Bracelets, one size fits All $4.50 each minimum order 4 pc. JESUS Magnetic Copper Bangle (Cuff Bracelet) with 6 strong Magnets 3 on each side, each Magnet between 2000-3000 gauss, smooth finish, highly polished, solid Copper Bracelets, one size fits All $4.50 each minimum order 4 pc. Heart Magnetic Copper Bangle (Cuff Bracelet) with 6 strong Magnets 3 on each side, each Magnet between 2000-3000 gauss, smooth finish, highly polished, solid Copper Bracelets, one size fits All $4.50 each minimum order 4 pc. Heavy Waves Magnetic Copper Bangle (Cuff Bracelet) with 6 strong Magnets 3 on each side, each Magnet between 2000-3000 gauss, smooth finish, highly polished, solid Copper Bracelets, one size fits All $4.80 each minimum order 4 pc. 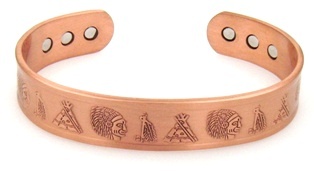 Celtic Magnetic Copper Bangle (Cuff Bracelet) with 6 strong Magnets 3 on each side, each Magnet between 2000-3000 gauss, smooth finish, highly polished, solid Copper Bracelets, one size fits All $4.50 each minimum order 4 pc. 1/4" Plain Magnetic Copper Bangle (Cuff Bracelet) with 6 strong Magnets 3 on each side, each Magnet between 2000-3000 gauss, smooth finish, highly polished, solid Copper Bracelets, one size fits All $4.50 each minimum order 4 pc. 1/2" Plain Magnetic Copper Bangle (Cuff Bracelet) with 6 strong Magnets 3 on each side, each Magnet between 2000-3000 gauss, smooth finish, highly polished, solid Copper Bracelets, one size fits All $4.80 each minimum order 4 pc. Heavy Wide Magnetic Copper Bangle (Cuff Bracelet) with 6 strong Magnets 3 on each side, each Magnet between 2000-3000 gauss, smooth finish, highly polished, solid Copper Bracelets, one size fits All $5.50 each minimum order 4 pc. Golden Leaf Magnetic Copper Bangle (Cuff Bracelet) with 6 strong Magnets 3 on each side, each Magnet between 2000-3000 gauss, smooth finish, highly polished, solid Copper Bracelets, one size fits All $4.50 each minimum order 4 pc. 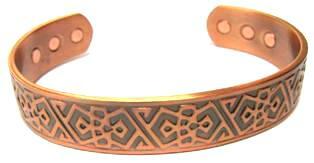 Two Tone Celtic Magnetic Copper Bangle (Cuff Bracelet) with 6 strong Magnets 3 on each side, each Magnet between 2000-3000 gauss, smooth finish, highly polished, solid Copper Bracelets, one size fits All $4.50 each minimum order 4 pc. Blacken Rope Center Magnetic Copper Bangle (Cuff Bracelet) with 6 strong Magnets 3 on each side, each Magnet between 2000-3000 gauss, smooth finish, highly polished, solid Copper Bracelets, one size fits All $4.80 each minimum order 4 pc. Three Tone Braided Magnetic Copper Bangle (Cuff Bracelet) with 6 strong Magnets 3 on each side, each Magnet between 2000-3000 gauss, smooth finish, highly polished, solid Copper Bracelets, one size fits All $4.80 each minimum order 4 pc. Waves Magnetic Copper Bangle (Cuff Bracelet) with 6 strong Magnets 3 on each side, each Magnet between 2000-3000 gauss, smooth finish, highly polished, solid Copper Bracelets, one size fits All $4.80 each minimum order 4 pc. Dots Magnetic Copper Bangle (Cuff Bracelet) with 6 strong Magnets 3 on each side, each Magnet between 2000-3000 gauss, smooth finish, highly polished, solid Copper Bracelets, one size fits All $4.80 each minimum order 4 pc. Two Tone Twisted Rope Magnetic Copper Bangle (Cuff Bracelet) with 6 strong Magnets 3 on each side, each Magnet between 2000-3000 gauss, smooth finish, highly polished, solid Copper Bracelets, one size fits All $4.80 each minimum order 4 pc. Tri Color Magnetic Copper Bangle (Cuff Bracelet) with 6 strong Magnets 3 on each side, each Magnet between 2000-3000 gauss, smooth finish, highly polished, solid Copper Bracelets, one size fits All $4.80 each minimum order 4 pc. Two Tone 3 Ropes Magnetic Copper Bangle (Cuff Bracelet) with 6 strong Magnets 3 on each side, each Magnet between 2000-3000 gauss, smooth finish, highly polished, solid Copper Bracelets, one size fits All $4.80 each minimum order 4 pc. Wide Cultic Knott Magnetic Copper Bangle (Cuff Bracelet) with 6 strong Magnets 3 on each side, each Magnet between 2000-3000 gauss, smooth finish, highly polished, solid Copper Bracelets, one size fits All $4.80 each minimum order 4 pc. Phoenix Magnetic Copper Bangle (Cuff Bracelet) with 6 strong Magnets 3 on each side, each Magnet between 2000-3000 gauss, smooth finish, highly polished, solid Copper Bracelets, one size fits All $4.80 each minimum order 4 pc. Thick 1/2" Wide Copper and Brass Magnetic Copper Bangle (Cuff Bracelet) with 6 strong Magnets 3 on each side, each Magnet between 2000-3000 gauss, smooth finish, highly polished, solid Copper Bracelets, one size fits All $6.00 each minimum order 4 pc. Blacken Chain Style Magnetic Copper Bangle (Cuff Bracelet) with 6 strong Magnets 3 on each side, each Magnet between 2000-3000 gauss, smooth finish, highly polished, solid Copper Bracelets, one size fits All $4.80 each minimum order 4 pc. Horizontal Cross Magnetic Copper Bangle (Cuff Bracelet) with 6 strong Magnets 3 on each side, each Magnet between 2000-3000 gauss, smooth finish, highly polished, solid Copper Bracelets, one size fits All $4.50 each minimum order 4 pc. Horizontal Lines Magnetic Copper Bangle (Cuff Bracelet) with 6 strong Magnets 3 on each side, each Magnet between 2000-3000 gauss, smooth finish, highly polished, solid Copper Bracelets, one size fits All $4.50 each minimum order 4 pc. Dotted Slashes Magnetic Copper Bangle (Cuff Bracelet) with 6 strong Magnets 3 on each side, each Magnet between 2000-3000 gauss, smooth finish, highly polished, solid Copper Bracelets, one size fits All $4.50 each minimum order 4 pc. Swallow Magnetic Copper Bangle (Cuff Bracelet) with 6 strong Magnets 3 on each side, each Magnet between 2000-3000 gauss, smooth finish, highly polished, solid Copper Bracelets, one size fits All $5.00 each minimum order 4 pc. Tri Color Braided Arrows Magnetic Copper Bangle (Cuff Bracelet) with 6 strong Magnets 3 on each side, each Magnet between 2000-3000 gauss, smooth finish, highly polished, solid Copper Bracelets, one size fits All $5.50 each minimum order 4 pc.